The National Chairman of the All Progressives Congress (APC), Mr. Adams Oshiomhole, yesterday tried to quench the raging fire in the ruling party, using kind words to describe its estranged governors, who had been up in arms against him, since the partyâ€™s recent primaries. Four governors, Senator Ibikunle Amosun (Ogun State), Chief Rochas Okorocha (Imo State), Chief Rotimi Akeredolu (Ondo State) and Alhaji Abdulaziz Yari (Zamfara State), had been engaged in a public spat with Oshiomhole, accusing him of scuttling the chances of their preferred candidates in the recently concluded primaries. 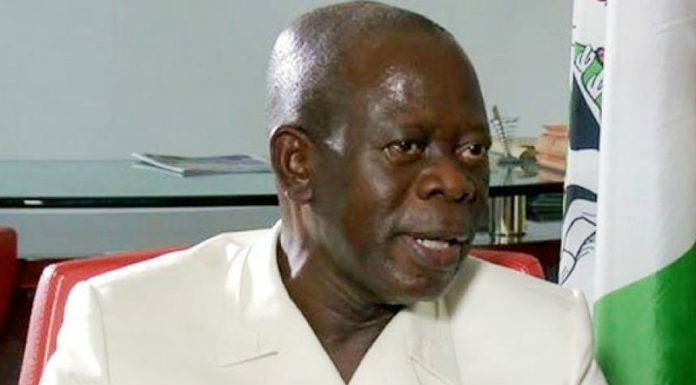 But speaking on Arise TV, a sister broadcast station of THISDAY, Oshiomhole held out an olive branch, seeking peace by describing the governors as good party men, who would support the party and its candidates in their respective states despite their grievances. Specifically, he ruled out the possibility of any of them working against the party in spite of their rage. Oshiomhole said, â€œI believe Governor Amosun is my friend and I believe people are entitled to feel disappointed if things donâ€™t work out the way they want. I think usually like any leader, he will recognise the greater interest of the party, I know he is a loyal party man; I canâ€™t see him voting with his feet. As a statesman, who has contributed to the growth and development of Ogun State, he will want to ensure that his party continues to govern the state and play the role of a statesman; I have no fear at all because this thing called choice is a relative question. â€œWhatever we have as internal issues in APC they do not in fact undermine that Amosun, has more things to show as governor of that state and for which I am very proud of as chairman of the party. I hope he can overcome his anger so that we can work to reconcile our various interests in Ogun State. He also spoke about Okorocha, â€œAs for my friend Rochas Okorocha, who talked about nepotism, well as the head of the family, I do not want to continue to bring family matters to the market. At the end of the day it makes sense to keep it in the family, that is what maturity and responsibility imposes on me. â€œSo I wonâ€™t join issues with him, but the truth is that while I was in government, there was no other Oshiomhole in government. This is not something to hide, as a journalist you can go to Edo State and ask how many Oshiomholes were in government while I was at Osadebe House. â€œWell, Okorocha is a great guy. He is one of those who left APGA to join APC. It is on record as having contributed his quota to the formation of the APC. â€œWe also have to accept that a tree cannot make a forest and we have to encourage those who think otherwise to recognise that this is a fact. â€œIn Imo State we have big names but it is not about big names, it is about big numbers. And the big numbers in Imo State are with us and I think governor Okorocha appreciates this fact. â€œNow as for whether people will decamp or not I am not so sure. Even if they do, they will not make history, after all, in recent past, sitting governors decamped for one reason or the other because they want to be president. Having decamped they found that there are so many aspirants, they have since reconciled themselves with the reality that though they decamped from the APC believing that they are going to be presidential candidate of the PDP, they got there and found an over-crowded house. â€œI think some of them have quietly taken the governorship ticket and some have even taken the senatorial ticket and they are living with the new reality. I think that is the way it is. He expressed the confidence that in spite of the current misgivings in the party in the affected states, the partyâ€™s candidates would still win since the main opposition Peoples Democratic Party (PDP) had its fair share of crisis. He said, â€œThe truth is that in Ogun State we will win because PDP has its own pocket of crisis as well. As we speak we donâ€™t know who is the actual governorship candidate in Ogun State because the national secretariat of PDP parades a certain candidate and a running mate and a certain group run by Buruji Kashamu with due respect to him also parade a governorship candidate and a running mate. â€œSo while they are sorting out their own issues we will be sorting out our own issues. He, however, said despite this shortcoming, the presidentâ€™s integrity would give him the edge in the forthcoming general elections slated for the first quarter of 2019. Oshiomhole, who spoke on Arise TV, a sister broadcast station of THISDAY, also backed organised labourâ€™s demand for the immediate implementation of the N30,000 minimum wage recommended by the National Minimum Wage Committee, which submitted its report to the president last week. He told his hosts on the â€œMorning Showâ€ programme of the station that the negative perception the APC-led government is grappling with was caused by poor communication of its achievements and the positive intentions behind its policies. Speaking on the negative predictions made by some international organisations and analysts over the chances of the presidentâ€™s reelection bid, the APC national chairman said those permutations were done by outsiders, who know little about what is happening in the country and how Nigerians feel about the Buhari- led administration. He said that the chances of the president are very bright and that Nigerians will always support his reelection on the ground of his acclaimed honesty and integrity. Oshiomhole further said that comparatively, Buhari stands as number one in terms of character and integrity amongst all the contenders in the presidential race. â€œI believe to answer your question is that President Buhari will certainly be reelected on the basis of his personal integrity and the fact that those who are contesting against him, there are couple of things they canâ€™t say about themselves that this president will not only say but other people will also say for him,â€ he said. Oshiomhole said the party would try during the campaigns to present to Nigerians what it had done and then situate it within what the past administration was able to achieve. He also spoke on the situation in the power sector, saying the APC-led administration had not spent a fraction of what the previous administration of the Peoples Democratic Party (PDP) spent on the sector. According to Oshiomhole, the challenge the power sector faces is the gross abuse the privatization process was subjected to by the past PDP administration, adding that the sector was handed over to incompetent hands due to political patronage. â€œI will expect that going forward we will have to revisit some of the things if we try to manage them not to be seen to revoke what has been done before and it is clear that the new guys lack the capacity; those things we have to revisit, review and maybe go back to the fundamentals,â€ he said. Apparently still leaking the wound inflicted on the ruling partyâ€™s ego by the defection of the Senate President Bukola Saraki to the opposition, PDP, Oshiomhole said there was no way the â€œminority leadership in National Assemblyâ€ could stand the test of time. â€œIt is unacceptable that minority provide leadership over majority. However he mismanages the process of manipulating the tools of reward, using all ways to sustain himself in power at a huge cost to the country, I remain convinced that Saraki must show honour and character by vacating voluntarily,â€ he said. On the brewing crisis over the N30,000 proposed new minimum wage the ruling party chairman said he disagreed with governors who said they cannot pay the proposed new minimum wage. He argued that for any sustainable growth in the economy to be achieved, government and employers of labour must be ready to pay living wage to their workers. However, when asked to throw more light on his encounter with the Directorate of State Security over bribery allegations, Oshiomhole clearly evaded it, saying that the matter had been over-flogged. He said, â€œI believe my brother that I have sufficiently spoken about the matter of interaction between myself and the DSS and I have nothing new to add to what I have already said. If there are people that remain unclear, they should go and read my statements in the press or play back what was recorded in the electronic media. â€ I think we should move on to real issues of development and real issues of why we are in politics, what is in it for Nigerians as we proceed to the 2019 elections, what are we going to do different, what is the opposition bringing to the table and how is APC going to respond to it. This should be worth my while and I believe this will excite Nigerians,â€ he said. The former Edo State governor said he would like to move away from the issue of allegations and counter allegations and to address the real issues concerning the 2019 general elections and how the party intends to win the support of Nigerians. He was also evasive on the partyâ€™s primary election crisis, saying the party had moved on and is now focusing on reconciliation of aggrieved members.